Cynthia Houston didn’t panic when she lost her job at the Mount Pleasant School District in 2008. She looked for another job and paid the extra money to keep insurance through COBRA. She found work but couldn’t afford insurance there. That was when she had a breakdown. She eventually found help. But state efforts to help Iowans without health insurance pay for doctor visits and other medical care fail to reach all who could use the assistance, a review by five Iowa news organizations of the state’s health care delivery systems for uninsured Iowans reveals. Geographic limits, alone, ensure that one program Houston was referred to – IowaCare – does not reach all Iowans who need it, even though it is considered to be a last resort for Iowans ineligible for other programs that fund accessible, affordable health care. One in 10 Iowans lives without health insurance. Estimates range from 312,600 by the Kaiser Family Foundation to 342,000 by the U.S. Census Bureau. They live in a state where some health care professionals — although not all — predict there won’t be enough available primary care providers to handle growing demand for health care in Iowa from aging baby boomers, working people with inadequate insurance coverage and others entering the health care market. 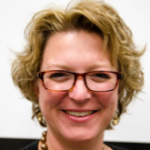 “It seems to me, from my perspective, to be a perfect storm,” Wendy Gray, executive director of Free Clinics of Iowa, said about that anticipated convergence of trends. The health care workforce, which includes specialists, physician assistants, nurses and others, is a concern, said Dr. Stephen Eckstat, board president of Free Clinics of Iowa and CEO at Mercy Clinics Inc. of Des Moines. But, he said, he expects Iowa to have enough primary care doctors, with Des Moines University and University of Iowa Hospitals and Clinics graduating them and the doctors staying here. The most serious concern, Eckstat said, is that people increasingly cannot afford insurance. “The crisis is financial,” he said. Free Clinics of Iowa’s network of 33 free medical clinics dealt with more than 13,600 patient visits in each of the past two years, up from 13 clinics handling 5,018 clinic visits in 2005. It did not count the number of patients making the visits but about 11,000 visits each of the past two years were by people lacking health insurance, the organization’s records show. 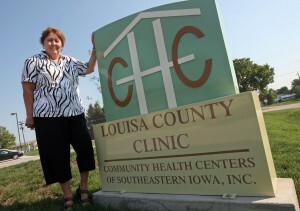 Free medical clinics are but one safety net for uninsured Iowans. In Cedar Rapids, a community with two hospital systems, a federally subsidized community health clinic and a reputation for low-cost, high-quality care, some patients fall through the cracks and often rely on free health clinics for basic care. Demand for the Iowa City Free Medical Clinic’s services has risen sharply over the last two decades, despite UI Hospitals and Clinics being in the same city. In fiscal year 1991, almost 3,700 visits were made to the free clinic. Last year, that number had jumped to more than 6,200. “We see uninsured patients, as well as patients who have insurance that excludes certain conditions, or policies with an extremely high deductible,” Jennifer Miller, the clinic’s case manager, said. The Free Clinics of Iowa network’s small clinics, sometimes operating only three to five hours a week in church basements, community centers and other available buildings, aren’t confined to traditionally low-income areas. Gray referenced clinics in West Des Moines, where the median household annual income was $63,978 and 6.1 percent of the people lived below the poverty level during the 2010 census, and Waukee, medium household income of $74,413 and 2.8 percent below the poverty level. So are places like UI Hospitals and Clinics. A 2011 report from the Iowa Hospital Association shows the medical complex served almost 380,000 “community benefit” patients last year. That includes those with uncovered Medicaid and Medicare costs, patients who didn’t pay in full for their services and more than 12,000 “traditional charity care” patients. “University of Iowa Hospitals and Clinics is committed to treating all Iowans, regardless of their ability to pay for their care,” hospital spokesman Tom Moore said. Medicaid, available to low-income and some disabled Iowans but also some with extremely high medical bills. Healthy and Well Kids in Iowa, or hawk-I, and a Medicaid expansion program in the Children’s Health Insurance Program for Iowa that covers children of low-income working families. IowaCare, for those ineligible for Medicaid or hawk-i. Almost one of every four Iowans is expected to use Medicaid this fiscal year, which started July 1 and runs through June 30. That is 698,000 Iowans in a program on track to pay almost $4 billion to 38,000 health care providers this budget year. The state will provide one-half of that money, the federal government the other half. 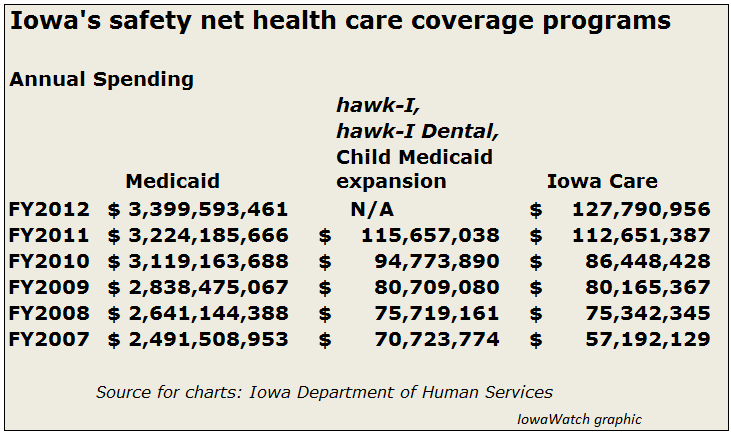 Iowa’s Medicaid program is so big it is the state’s second largest health care payer. Only Wellmark serves more, the human services department points out in a report on its current budget year. Enrollment in Iowa’s Medicaid program increased 5.4 percent in fiscal 2011 from the previous year. At least the increase slowed down. It was 9.4 percent in fiscal 2010 from the previous year, the human services department reports. Expanding Medicaid in Iowa to include more patients would increase enrollment in the program about 25 percent, from 110,000 people to 130,000, the Department of Human Services predicts in a report it compiled for this budget year. That estimate may be low. Department officials and researchers looking into the system said in interviews 150,000 to 180,000. Expansion is being discussed, and people enrolled in IowaCare would be part of it, moving into Medicaid for full benefits there. Cynthia Houston, 60, has had Type I diabetes for about 45 years and heart issues since a heart attack five years ago. She credits the Community Health Centers of Southeast Iowa for keeping her healthy and helping her find other ways to access affordable care. Through the center’s Columbus City clinic, 12 miles from Winfield, she got on a prescription drug assistance program and applied for IowaCare, for access to cataract surgery at UI Hospitals and Clinics. 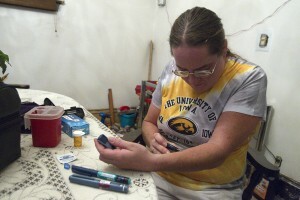 Elizabeth Busler, 35, works odd jobs when she can but needs five insulin shots daily to control her diabetes. She found help as a recent enrollee in IowaCare. But even before she moved to Cedar Rapids late last month she traveled from Vinton for medications at the Community Health Free Clinic. Despite moves to reach more people Iowa is in a waiting game when designing a way to cover the costs of uninsured Iowans’ health care because of uncertainty over whether or not the state will expand Medicaid. That expansion is called for under the Affordable Care Act, known better as Obamacare. The law allowed the federal government to take Medicaid funding away from states that did not expand coverage to more people. But while famously upholding the law during the summer, the U.S. Supreme Court said in its National Federation of Independent Business v. Sebelius ruling that states are not obligated to expand. That led Gov. Terry Branstad to say Iowa should not expand because of costs to a stressed federal budget. But the system Iowa has been planning, to date, to increase coverage opportunities is based on expanding Medicaid. The reason: the Affordable Care Act has been law since 2010, and has deadlines for completing action toward full implementation at the beginning of 2014. The Department of Human Services has planned for spending $3 million over three years for a new computer system it will use to determine patients’ program eligibility. Health care exchanges, through which people can buy insurance, must be established. “There are other things that are services and other benefits that are being rolled out on a regular basis that we have to accommodate, too,” the department’s Palmer said. The state is using IowaCare, which started in 2005 as a replacement for Iowa’s old indigent care program, as its bridge to 2014. The decision to do that was made two years ago, when the program needed to be renewed through 2013. Having IowaCare, despite limitations in that system, kept Iowa from having to start from scratch. It is to expire at the end of next year, with no other substitute plan for covering those receiving it now. Republican presidential challenger Mitt Romney has said he would work with Congress to repeal the Affordable Care Act but first would give states waivers that allow them to opt out of the law’s requirements. President Barack Obama would continue to implement the law he worked hard to get passed and upheld in the Supreme Court. Branstad, a Republican, is waiting for November’s federal election outcome to determine how to proceed. “While we don’t know the outcome yet, we’re prepared for either scenario,” his press aide, Tim Albrecht, said. Rep. Beth Wessel-Kroeschell, D-Ames, the ranking minority member of the House Human Resources Committee, said she expects Medicaid expansion, which she supports, to get a full airing in the next legislative session. “As we implement the Affordable Care Act in Iowa and we expand Medicaid, we will begin getting to more and more of these groups that we need to get to,” she said. The Affordable Care Act orders states to provide Medicaid to people living below 133 percent of the poverty level. That 133 percent level is $14,856 in annual income for one person. It is $30,657 for people living in a family of four. The IowaCare program provides health care coverage for Iowans living below 200 percent of the federal poverty level, or $22,340 for an individual and $46,100 for someone in a family of four. Most patients in IowaCare get their care free, although some pay a portion of their costs on a sliding scale. The program has more limitations – on medications, durable medical equipment and mental health, for example – than the Medicaid program. Moreover, it never was established to serve as a be-all, catch-all program for uninsured Iowans. It replaced the Iowa Indigent Care Program, or the “papers” program, through which all counties but Polk sent low-income patients to UI Hospitals and Clinics for free health care. Polk County had a program that sent patients to Broadlawns Medical Center in Des Moines. IowaCare started with centers at the UI and Broadlawns, then expanded to include hospitals in Waterloo and Sioux City in October 2010, mainly because the long travel to Iowa City or Des Moines made the program impractical for people in many parts of the state. Now eight centers exist. Dubuque’s Crescent Community Health Center, which started providing primary IowaCare services for eight northeast Iowa counties on Dec. 1, served more than 700 IowaCare patients during the first three months of 2012. “We’ve been pretty busy with IowaCare,” said Julie Woodyard, Crescent’s director. State legislation authorizes having up to 14 federally qualified health centers in the state. It also calls for using a medical home model, in which a doctor, physician assistant or nurse practitioner coordinates a patient’s health care, referring as needed to specialists, laboratories, pharmacies, dental care, mental health services and hospitals. An electronic health records health network being developed will help with that coordination, Iowa Public Policy Center Director Peter Damiano said. The Iowa Public Policy Center is studying the impact the Affordable Care Act will have on health care delivery. While Medicaid and hawk-I have their established limits, attention has been given to the IowaCare program. The UI center found problems when it surveyed 1,708 IowaCare patients in winter 2010-11. Two of every three patients needing either routine or urgent care said they always or usually received it as soon as they thought they needed it. One-half of those needing urgent care usually received it on the same day. However, 19 percent – or one of every five patients – reported waiting 15 days or longer to receive urgent care. Almost one-half, or 45 percent, of the patients trying to get medical help by phone said they got it only sometimes or never. The 55 percent with better responses marked a decrease from around 75 percent in 2008. One in four needing preventive care was unable to receive it, the study showed. Yet, a majority received preventive care, which leads to the value judgment policy makers have to make with such data: is this good, or is it bad? “To be honest, we struggle with that all the time,” Damiano said. Damiano, who also is a UI professor of preventive and community dentistry, said the center does not advocate for or against programs but that state policy makers seek guidance. “The way I’ve sort of come to think about this is that, for about a third of the people, the program seems to work really well, and provides excellent care,” he said. “And so this program really is a safety net for these folks, and really works very well for about a third of them. “For about a third of them it works pretty well. It’s not great, it doesn’t do everything, but it’s certainly a whole lot better than having nothing. 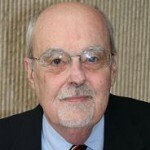 The main reasons for not getting routine care when needed were transportation or travel distances to care centers, the inability to afford care, the lack of IowaCare coverage or trouble getting an appointment at UI Hospitals and Clinics or Broadlawns, the Public Policy Center study found. “I think you have to take those numbers within the context of how the program is structured,” Jennifer Vermeer, director of the Iowa Medicaid program, said. Department of Human Services leaders expect the IowaCare program to cover 91,171 adults in this budget year, which ends June 30, 2013. It served 87,229 in all of fiscal 2012. People move in and out of the system, though, so those numbers do not represent how many are in during a given month. The number IowaCare leaders pay attention to is 61,100 clients, its current enrollment, and highest to date. State officials have learned lessons from the IowaCare program. Vermeer said experiences are showing that having medical centers as medical homes for patient care can help people with chronic diseases. Another lesson, she said, is that people need plenty of assistance to navigate the health care system, especially if they never had insurance before. Vermeer said she sees improvement, given that only two IowaCare health centers existed before 2010, and only four before the recent expansion to eight. “Now, with that being said, if you had all the money in the world is this how you would design a program? I would say no, because it does have a lot of access issues,” she said. IowaWatch staff writer Sujin Kim contributed to this story. IowaCare started in July 2005 at University of Iowa Hospitals and Clinics in Iowa City and Broadlawns Medical Center in Des Moines. It expanded in 2010 to include Peoples Community Center in Waterloo and Siouxland Community Health Center in Sioux City. By Jan. 1, 2012, four more IowaCare medical homes had been established at Community Health Center for Fort Dodge, Crescent Community Health Center in Dubuque, Council Bluffs Community Health Center and Primary Health Care of Marshalltown. Patients going to Dubuque and Waterloo are referred to UI Hospitals and Clinics for specialty care. Patients going to Fort Dodge, Sioux City, Council Bluffs or Marshalltown for primary care are referred to Broadlawns for speciality care. Most IowaCare patients are single or childless couples. IowaWatch.org, the Burlington Hawk Eye, The Gazette (Cedar Rapids), Iowa City Press-Citizen and the Telegraph Herald (Dubuque) worked together this summer to report on the need for health care facing Iowans who do not have insurance. They reviewed more than two dozen documents and interviewed two dozen people. 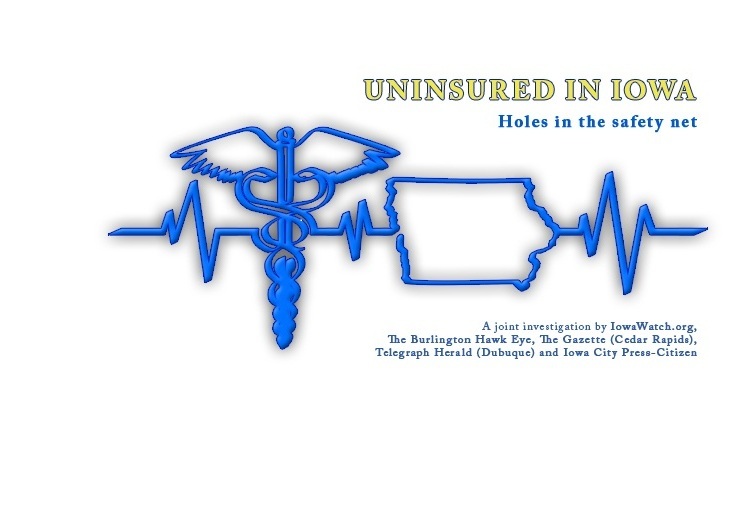 Jaime Vargas, of IowaWatch.org, created the Uninsured in Iowa logo. Uninsured people who don’t control otherwise treatable chronic health conditions quickly can become a statistic. Chronic conditions can lead to stroke, heart attack and other conditions that could be fatal. Untreated high blood pressure damages arteries, raising the risks for strokes or aneurysms ruptures in the blood vessels. High blood pressure can also create scar tissue that can catch debris such as cholesterol and plaque traveling through the bloodstream. Trapped blood can form clots that can contribute to heart attacks. Poorly treated asthma can cause scarring in the lungs that limits the amount of air able to move through the airways. Long-term complications of unchecked diabetes include stroke and heart attack. Excess sugar can damage the walls of the tiny blood vessels supplying nutrients to the nerves, especially in the legs. Poor circulation and nerve loss in the legs can increase the risk of cuts and blisters becoming serious infections. Blood-vessel damage in the eyes can lead to blindness. Payments go to: physicians, hospitals, labs, pharmacies, home health providers, rural health providers, federally qualified health centers (FQHCs), nursing facilities, chiropractors, physical therapists, home care providers, other providers. Medicaid covers 10 to 20 percent of most hospitals’ revenue, about 50 percent of nursing facilities’ revenue. Enrollees pay premiums on a sliding scale, based on ability to pay. • Medicaid Expansion – Health and dental services through Medicaid. Covered children come from homes with higher incomes than regular Medicaid patients but lower than the hawk-i program. 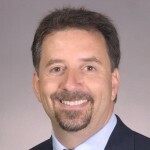 • hawk-i – Children covered through contracts with commercial managed care health and dental plans, covering prevention care (immunizations), primary care, hospital and emergency care, chiropractic care, vision, skilled nursing care, dental care, and behavioral care including substance abuse and mental health treatment. Income limit: 300 percent of the federal poverty level or below. • hawk-i Dental-only plan – Implemented in March 2010 for dental-only benefits that supplement other coverage the family may have. Isaiah Newsome likes to play sports and hang out with friends, like any 17-year-old. But most of the time these activities are cut short as his body, stricken with sickle cell anemia since birth, fills with pain. Getting health care for the disease has not been easy. I had no idea that high blood pressure could cause some serious damage to your heart and arteries. I hear that high blood pressure runs in my family. I definitely think that I should consider finding a reliable health clinic that could track my health state as I get older.